USB A jacks also are the equipments which are equally needed with the USB A plugs for a perfect connectivity. 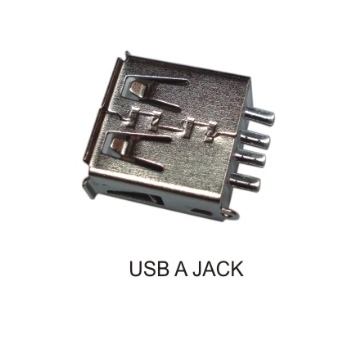 These USB A jacks are generally used for the installation in laptops and desktop computers for the purpose of providing most exclusive quality services for USB device connectivity. These USB A jacks are proved to be very much beneficial and helpful in providing a consistent and reliable connectivity of the computer peripherals and computer related devices. Being one of the most reliable and trusted companies we are offering these USB A jacks to our clients at a very conventional and attractive range of prices. We engaged in the concerned domain, we present an enormous range of our offered products are fabricated by assembling superior quality raw material and using the most recent technology. The product range mainly consists of connectors, charger connector, connector pin, charger connectors, mobile charger connectors, audio video connectors, usb connectors, computer connectors, nokia pin, nokia n series pin etc. Available at the most economical prices, these products are extensively used in various industries for different requirements. We offer charger connectors, mobile charger connectors, audio video connectors, USB connectors, computer connectors, nokia pin, nokia n series pin, five pin connector, RCA plug, RCA jack, RCA socket, RF plug, RF socket, HDMI connectors, stereo pin, double stereo pin, headphone connector and headphone plug. Bestowed with robust infrastructure and workforce of highly experienced professionals, our products are widely acclaimed owing to relevant features like corrosion resistance, tensile strength, durability and low maintenance. Additionally, these can also be custom made according to the specifications recommended by our valuable customers. Furthermore, our presented assortment is properly packaged and safely stored in warehouse before transportation.